2 CAN FENUGREEK PRESENT ANY CONTRAINDICATIONS? 2.1 What are the contraindications of fenugreek? CAN FENUGREEK PRESENT ANY CONTRAINDICATIONS? Diarrhoea, flatulence: fenugreek is contraindicated in people with digestive disorders. It can cause flatulence, bloating or diarrhea due to its high fiber content. At high doses, it can cause nausea and upset your stomach. Intestinal diseases. It can cause outbreaks and digestive disorders to people with dumping syndrome, inflammatory bowel disease, Crohn’s disease and irritable bowel syndrome. People allergic to legumes: some people are allergic to legumes (chickpeas, etc..) Fenugreek allergy can appear. The symptoms are manifested by sneezing, rhinitis, rhinorrhea (runny nose), asthma, watery eyes, persistent coughing, wheezing, or fainting. 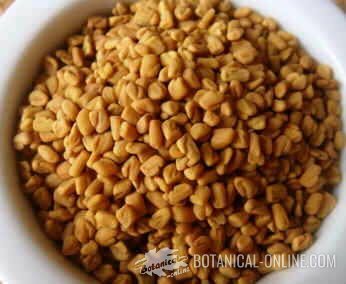 Pregnant women: fenugreek estrogenic effect and can cause miscarriage. Insulin: the combination of fenugreek supplements with insulin may cause hypoglycemia in people with diabetes. Trigonelline (nicotinic acid derivative) possesses hypoglycemic action. Oral antidiabetics: hypoglycemia can occur with the combination of oral agents (sulfonylureas, biguanides) and fenugreek. Antiplatelet or anticoagulant drugs (NSAIDs included). Fenugreek contains coumarin which can increase the risk of bleeding. Drugs for cholesterol: it may potentiate the effect of these drugs when consumed fenugreek, which can cause unwanted effects. You should talk to your doctor before supplementing your diet with fenugreek.